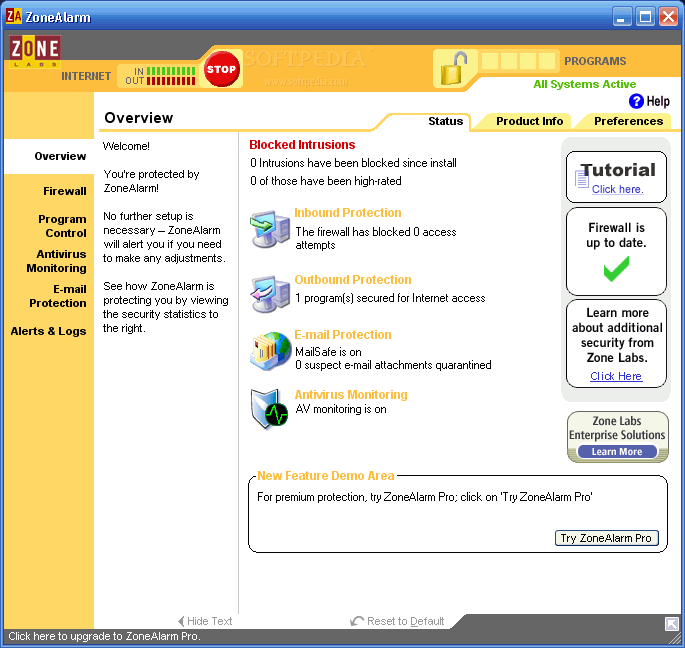 ZoneAlarm guards your PC - stopping hackers and other intruders in their tracks. ...... it can be activated automatically with your computer's screensaver or after a set period of inactivity. Zones monitor all activity on your computer and alert you when a new application attempts to access the Internet. * Analyzes browser downloads in three unique ways before they can infect your PC and warns if they are malicious. * Free Credit Bureau Monitoring - Protects your identity with daily credit report monitoring and provides victim recovery services. * Works well with other free and paid (non-firewall) security products, such as AVG and Norton Antivirus. * Automatic Program Control - See less alerts than with ZoneAlarm Free Firewall. * OSFirewall - Monitors changes within your computer to spot and stop new attacks that bypass traditional anti-virus protection. * Anti-phishing and Site Status - Blocks fraudulent websites including "phishing" sites that trick you into entering personal data. Qweas is providing links to ZoneAlarm Free 2012 as a courtesy, and makes no representations regarding ZoneAlarm or any other applications or any information related thereto. Any questions, complaints or claims regarding this application ZoneAlarm Free 2012 must be directed to the appropriate software vendor. You may click the publisher link of ZoneAlarm on the top of this page to get more details about the vendor.